Nestled in the High Atlas Mountains, the village of Imlil boasts a pleasant, cool climate and scenic surroundings. 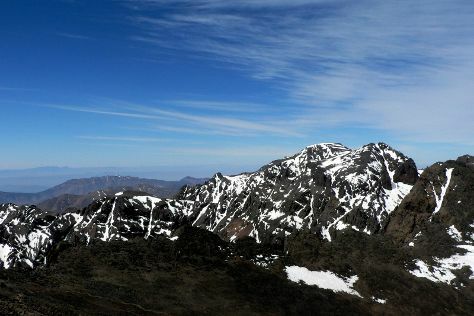 On the 18th (Sun), take in the awesome beauty at Mount Toubkal. For maps, more things to do, where to stay, and tourist information, use the Imlil trip planner. Marrakech to Imlil is an approximately 1.5-hour car ride. You can also do a combination of shuttle and taxi. Finish up your sightseeing early on the 19th (Mon) so you can go by car to Marrakech. Marrakech is known for parks, shopping, historic sites, spas, and museums. Your plan includes some of its best attractions: admire the natural beauty at Jardin Majorelle, stroll the grounds of Saadian Tombs, contemplate the long history of Bahia Palace, and admire all the interesting features of Marrakech Souk. For more things to do, maps, where to stay, and more tourist information, refer to the Marrakech road trip planning site . Traveling by car from Imlil to Marrakech takes 1.5 hours. Alternatively, you can do a combination of taxi and shuttle. In March, plan for daily highs up to 28°C, and evening lows to 11°C. Finish your sightseeing early on the 22nd (Thu) to allow enough time to travel back home.